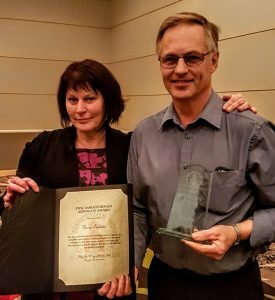 (North Battleford) Glaslyn resident Denis Ouellette, President of CUPE Local 4797, has been awarded the CUPE Saskatchewan Education Workers’ Steering Committee activist award. Ouellette works at the Northwest School Division as a caretaker. He has been a CUPE member for 12 years, and has served as a steward, a member of the executive, and as the president of his local. Ouellette has participated in four rounds of bargaining and achieved gains for his members each time. He has spent countless hours traveling across the school division and on the phone informing his members and making sure they understood the issues and knew the bargaining committee was there for them. Ouellette was surprised to receive the award. The CUPE Education Steering Committee represents 7,000 support workers in PreK-12 education, including education assistants, facility operators, administrative assistants, clerical assistants, secretaries, school bus drivers, caretakers, maintenance workers, library assistants, nutrition coordinators, information technicians, social workers, counselors, community school coordinators, interpreters, speech and language assistants, brailist, and other school support workers.